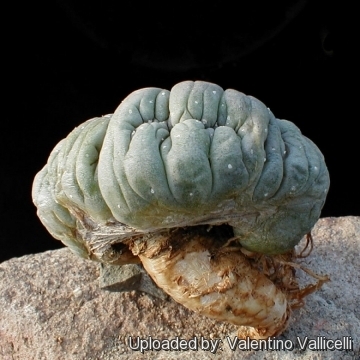 Lophophora sp. (williamsii?) 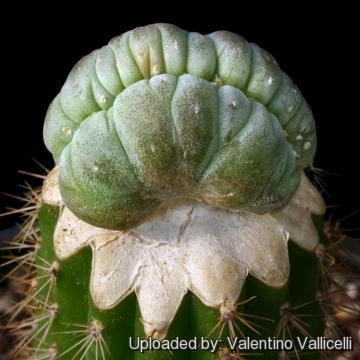 forma cristata. Photo and © copyright by Andrew Collin (Texas, USA) Sometime a crested palnt produce some normal shoots. Which are not monstrous at all! But all this very different forms are the same plant! They are epigenetic variation not genetic mutant! 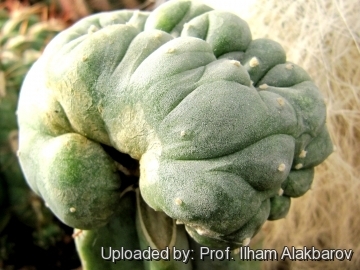 Description: The Lophophoras are famous spineless cacti commonly known as "Peyote". The stem is often glaucous green, dull bluish or greyish green, very succulent, globular, top-shaped, or somewhat flattened with a woolly top. There are several different species, variety and forms (plus some intermediates and hybrid populations) In addition to the foregoing there exists an impressive array of cristates which forms nicely contorted and convoluted brain-like mounds. 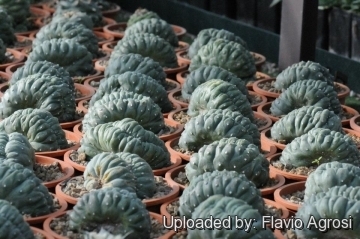 They are some of the more striking and priced crested cacti. They shows different crested shapes each of them has its own particular fascination. 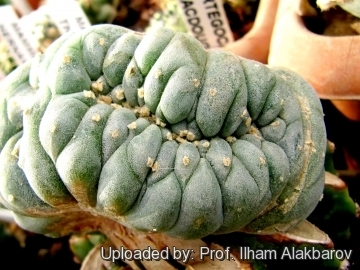 Remarks: The long time known L. williamsii 'Cristata' is the more common and famous, but more recently cristates of segregate species have been illustrated and given Japanese names by Sato (1999). 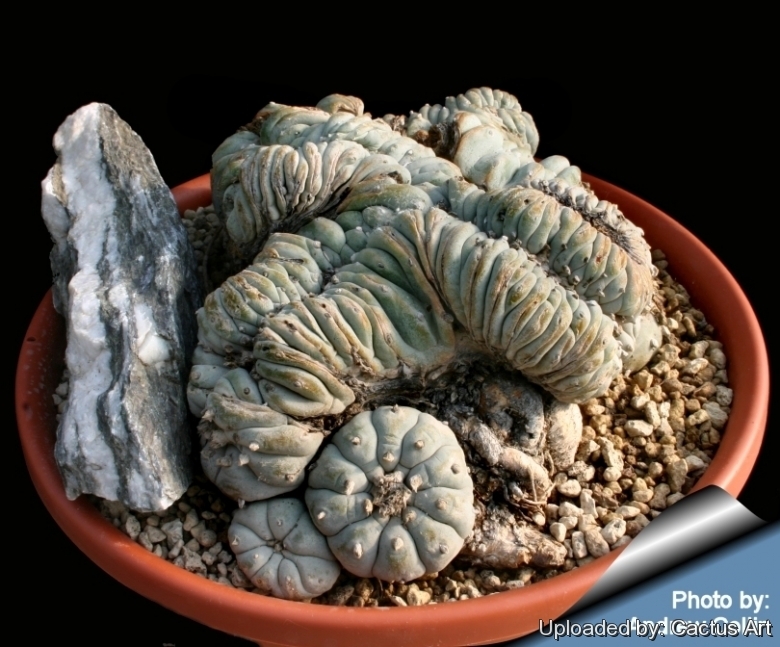 Cultivation and Propagation: All Lophophora species are extremely slow growing, often taking up to thirty years to reach flowering age in the wild (about the size of a golf ball, not including its root). Human cultivated specimens grow considerably faster, usually taking from six to ten years to go from seedling to mature flowering adult. Moisture: Waterings should be rather infrequent to keep the plant compact and not to become excessively elongated and unnatural in appearance, watering it properly is often difficult because this plant tends to crack open or rot if over-watered. The fact that the plant retracts into the soil and assume a grey-green colouring between watering, is perfectly natural and doesn’t cause any damage. 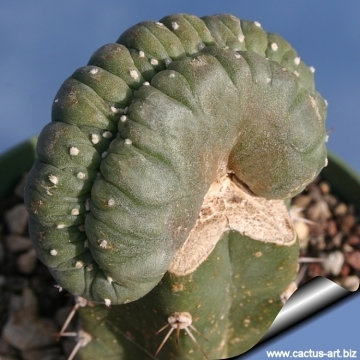 Specific tips for growing the crested forms: The crests are frequently grafted onto columnar cacti but are easily grown on their own roots. Any normal shoots should be removed to promote the growth of the crest. Propagation: Grafting or cuttings in summer (Cuttings will root only in hot weather. Cuttings must be kept very dry to root). The sowing of seeds collected on crested specimen give occasionally raise to some crested plants, but whit a very low frequency. The seeds requiring hot and humid conditions to germinate.